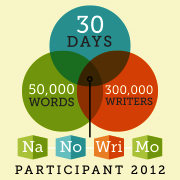 Well the first day of NaNoWriMo is done and dusted. I am happy to say that while I didn't make the recommended daily target of 1666 I did at least get something out. In fact I managed to get some 1200 words out. Words that right now even seem to make sense. Of course given it is some ridiculous time after midnight I am not really sure whether that sense will still be made in a few hours when I get up and re read it. Mind you that didn't stop me from hitting the publish button. The first 30 in 30 story is live and can be read here if you are so inclined. Did I mention how good it feels to have one already under my belt? I need to keep reminding myself of the positives because there are a few little not so positives about it. Firstly it was supposed to be a romance set in a forest and involve a basket. (Many thanks to Deb over at Home Life Simplified for the prompt.) Without giving too much away, because obviously I want you to go over and read it, so far the only part that rings true is that I did use the word basket. I wanted to keep going with it when I stopped but I really need sleep. Apparently it isn't just for the weak, it is in fact a necessity and one I am very short of at the moment. I feel like I have been hit with a rather bad case of insomnia the last few weeks. Now though I am just about running on empty. Three to four hours a night is not really enough, but what can you do hey? Back to my story issues. Thanks to some of my lovely readers I have roughly 30 suggestions, though there are a few that I am just not sure I can do. I know that the whole idea of a challenge is to challenge oneself, but at the same time I am really conscious of not challenging myself too much. I can be very easily overwhelmed sometimes and I really don't want this to be one of those times. Thankfully though, since the whole 30 stories in 30 days was all my own little brainwave, I am able to change the rules as a see fit. Not that I really had any rules but you know what I mean. I am still not sure what I want to change or what I would change it to, or if I even will. Who knows what I may think after a bit of sleep. What I do know though is that one way or another I will reach my 50000 word target and I will have lots of wonderful stories to share. It had been a long day. A really, really long day. Again. Lately every day felt like it was longer than the last. Which would have been bearable Sally were able to get more done. Instead it seemed like she was constantly achieving less and less. All the while her to do list was growing at exponential rates. She knew that life wasn't meant to be easy but she didn't understand why it had to be so damn hard all the time either. Admire your commitment! I can't even finish a month of #photoaday. After reading your story, I suddenly have an urge to have a coffee...with milk. :) I really got the feeling of Sally's being hot and uncomfortable. Good luck for the rest of the month! Thanks Shelly, who knows whether I will get there or not but it is all about giving it a go hey? Ready to read some more!!! Make sure you write some notes about what you where you want to go with this character that you like so much! That way when you're finished NaNoWri you can go back and continue her story. Rhianna, good on you for getting 1200 words written - it's an intriguing story so far. I watched my husband struggle last night with his NaGaDeMon project (writing a game with rules and setting in 30 days, based on NaNoWriMo) and I'm sure I would have just given up even before I'd begun. I have enough trouble keeping up with the blog... Good luck for November! 1200 words is huge, Rhianna! Well done! Look forward to following you this month and seeing how you go with the challenge. I know you'll do brilliantly! Day one done, and hopefully day 2 by now!